Florida’s best St. Patrick’s Day celebrations. Slips, hotel and dinner reservations will book quickly, so get your green on, get your Irish up, and sign up now. A very limited number of slips are being held at Melbourne Harbor Marina. If you require a slip, contact Fleet Captain John McLerch: johnalerch@gmail.com. Slips will be reserved on a first-come first-serve basis. FRIDAY NIGHT there will be a club dinner at 7 pm at The Dove (www.thedovefl.com), 836 E. New Haven Avenue, Melbourne, FL 32901. Phone 321-725-DOVE. Prix Fixe Menu $40 per person, not including tax, tip and alcohol. APPETIZER: Chef’s Choice. SOUP or SALAD. ENTREES: Beef au Poive, Veal Marsala, Shrimp Scampi, Flounder Francese, or Special of the Evening. DESSERT: Cannoli. To reserve, contact Fleet Captain, John McLerch: johnalerch@gmail.com. SATURDAY DAY the parade will begin at 11 am and travel down New Haven Avenue. Highlights include Irish dancers, bagpipers and non-stop live music. Bring a folding chair, a big appetite, and your thirst. SATURDAY NIGHT there is no organized dinner. But, there will be docktails at 6 pm at Melbourne Harbor Marina. BYOB and an appetizer to share. SUNDAY cruise back to Palm Cove. The Radisson Suite Hotel Oceanfront (321-773-9260) is currently quoting holiday rates for March 15 & 16 at $238 per night. Other similar beachfront hotels are more expensive. It’s next door to Lou’s Blues. For a memorable breakfast, go to the Blueberry Muffin, 1130 Florida A1A Indialantic, Melbourne Beach, FL, 32903 (www.radisson.com/melbourne/florida). An alternative is the Hilton Melbourne Rialto Place (321-768-0200), which is currently quoting $184 per night. It's on the mainland 5 minutes from town, 200 Rialto Place, Melbourne, FL 32901Better pricing may be gotten on websites like www.trivago.com. MELBOURNE MOTOR COACH RESORTS. For those traveling in their RV, there are two parks. Land Yacht Harbor of Melbourne mainland side, 8 miles from marina, 201 N John Rodes Blvd, 321 354 6398. Or, Outdoor Resorts Melbourne on beach 7 miles from marina, 214 Horizon Lane, 321 724 2600. 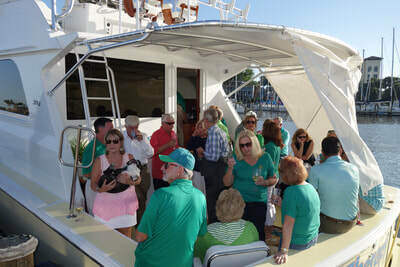 PLEASE WEAR YOUR IRISH GREEN PALM COVE YACHT CLUB SHIRT TO FRIDAY DINNER AND SATURDAY PARADE. IF YOU NEED A SHIRT, CONTACT TRISH O’McCLUSKEY: johnpat70@comcast.net.